Nothing suitable in promotional refresher towels? How about custom branded compressed towels & t-shirts, logo printed corporate beach towels or one of our promotional bathrobes? Custom branded refresher towels are cheap and make a great promo direct mail and mail out piece to advertise your brand and business, creating great brand awareness and brand exposure. 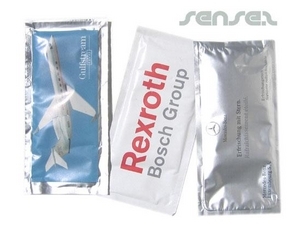 Sense2's refresher towels range include: your own design or company logo printed after sun refresher towels, promotional alcohol wipes, promotional anti bacterial wipes, promotional car windscreen towels, promotional de-stress refresher towels, own design printed headache refresher towels, promotional jetlag soother refresher towels, promotional makeup remover towels, cheap custom printed mobile phone cleaner towels, inepensive mosquito itch relieving refresher towels, custom printed mosquito/insect repellent towels, sports merchandise muscle soother refresher towels,customized nail polish remover towels, promotional revitaliser refresher towels, promotional relaxing eye refresher towels, branded sleeping towels, logo sunscreen towels, individualized tooth soothing towels and more. Refresher towels branded with your business logo make great advertising tools and are perfect for large group gift giveaway and direct mail outs. 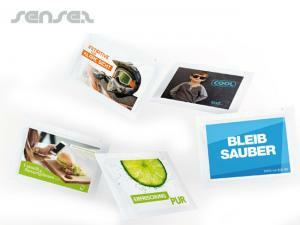 They are small, light, compact and cost efficient making them the perfect marketing product for your advertising promo. 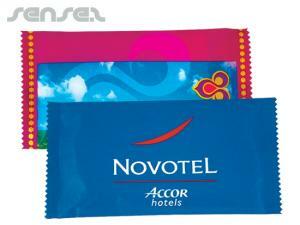 Custom printed refresher towels are ideal for travel, outdoor and beach campaigns. Refresher towels with promo printing make effective marketing promo articles to boost brand awareness and brand exposure.